As the UK's largest retailer of Cast Iron Radiators we have a wide range of accessories, valves, pipe shrouds and wall ties to add the finishing touches to your cast iron radiators. 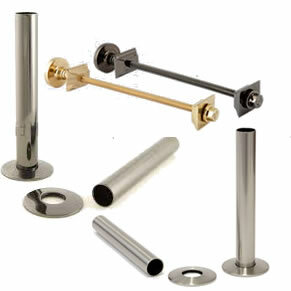 Our traditional valves are available in either Thermostatic or Manual valves. Thermostatic valves have a thermostatic pin in them so that if the cast iron radiator gets too cold, the pin will open up and allow warmer water to flow into the radiator. This saves the cast iron radiators from freezing which can destroy the cast iron radiator. If your cast iron radiator is placed in a room that gets particularly cold in winter or is left without heating for any length of time resulting in a possible frost risk - it is essential that you fit Thermostatic Valves to your cast iron radiators. Manual Valves need to be switched on and off by hand in the traditional way. 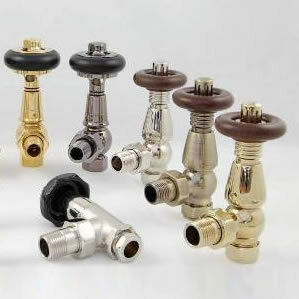 Our valves are also available in a range of beautiful metallic finishes including brass, chrome, antiqued brass, copper, nickel and black nickel. Pipe shrouds are purely cosmetic. They are placed below the valve to cover any untidy pipework, the hole in the floor where the radiator pipe emerges or simply to match the valve. If you go for a chrome, nickel or black nickel valve you almost certainly want to buy pipe shrouds so that the 'pipe' matches the valve on your cast iron radiators. Cast Iron Radiators are extremely heavy and it is essential that you order wall stays for all radiators other than the 9 column or the 7 column. Whilst it is extremely unlikely that a cast iron radiator will be pulled over, if a particularly determined child swung on the cast iron radiator, it is conceivable that they could pull it over. Wall stays are available in standard steel or in a metallic finish to match your radiator valve. We generally supply a small pot of touch up paint with each cast iron radiator order, this can be used to paint the standard steel wall stay. If you have any questions about accessories for cast iron radiators, please do not hesitate to contact us on 01723 321 000.